Uproar has arisen in Egypt over the planned banning of the face veil, or Niqab, by Al-Azhar University’s chief sheikh Muhammad Tantawi. The plan came to light after Tantawi, who took up his current post in 1996, told a student in an Azhar affiliated middle school to remove her niqab during a class session after entering the classroom. Women generally wear the niqab to protect themselves from being seen by men. Since the decision to ban the veil, which is usually a piece of cloth separate from the headscarf that covers the entire face except for the eyes, many citizens, including scholars and Al-Azhar students, have taken to protesting the decision. Many students also find disturbing the decision, which reportedly bars women wearing the niqab from government subsidized housing or entering any Al-Azhar facility or affiliated facility. International Qur-anic Open University (IQOU) student, who currently studies at Al-Azhar, Durdana Shakir said that though she does not wear the niqab, she believes the female students who choose to do so should be allowed to. “It’s their decision to wear it, and now many of our classmates are questioning if they should continue studying at Al-Azhar because they see the niqab not only as a preference, but an obligation,” she said. In fact most Islamic scholars agree that the face veil is not a religious obligation, but is still preferred by many women as a means of protection. Many others take it as an obligation and refuse to remove it in front of men who are not family members. 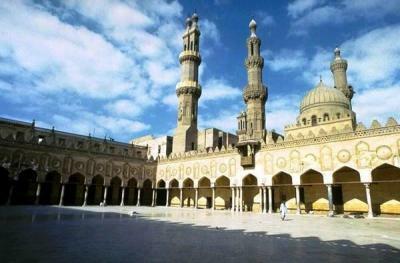 Sheikh Abu al-Hassan has said that the women at Al-Azhar should be allowed to wear the niqab on the grounds that it “is not in contravention of Sharia (Islamic law) or Egyptian law.” Many support Shiekh Tantawi’s decision to ban the face veil as they cite several problems it creates in schools. For example, there have been reported cases of men dressing up in full female Islamic garb and entering women-only facilities undetected. Citing such incidents, ISI member Abdul Hamid al-Atrash said that the face veil was being abused by people whose intentions were to cause trouble. “…There is no reason why a ruling that benefits the people and the nation cannot be issued,” he said, as reported by Al-Jazeera. But another IQOU student studying at Al-Azhar, Safiyah Salaam, has a different view. She sees the issue of wearing the niqab as one of personal choice intent on pleasing Allah, which should not be prevented by anyone. “I think that if someone wants to wear it to be more pious and they think it will bring them closer to Allah, then anyone who tries to stop them could get their punishment from Allah,” she said. Since the planned ban came to light, the opposition to it has grown, and Tantawi, who is widely mistrusted by many and seen as trying to manipulate the historically respected institution of Al-Azhar for political ends, is facing calls to step down or be removed from his post. Others see the move as an attempt to counter the growing influence in Egypt of Wahhabism or Salafism (an extreme interpretation of Islam, which originated and is mostly followed in Saudi Arabia). “Though I agree that it’s impractical to wear the niqab during lessons, I disagree with the extent to which the administration has chosen to deal with the issue, because so many women prefer to wear it,” said IQOU student Qaasim Wasi. “If they want to stop the misinterpretations of Islam like Wahhabism, then they should do it through education, not repression,” he said.